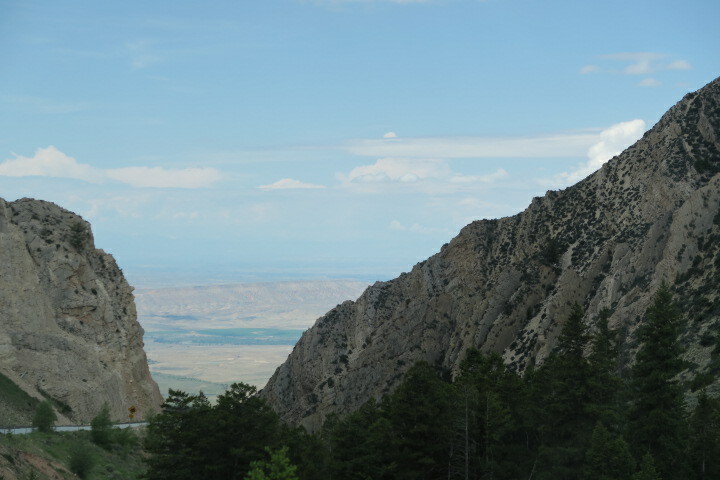 We cross the Bighorn Mountains for the second time, this time by traveling to Sheridan and crossing via Rt. 14A. This road is more scenic than yesterday’s Rt. 16. 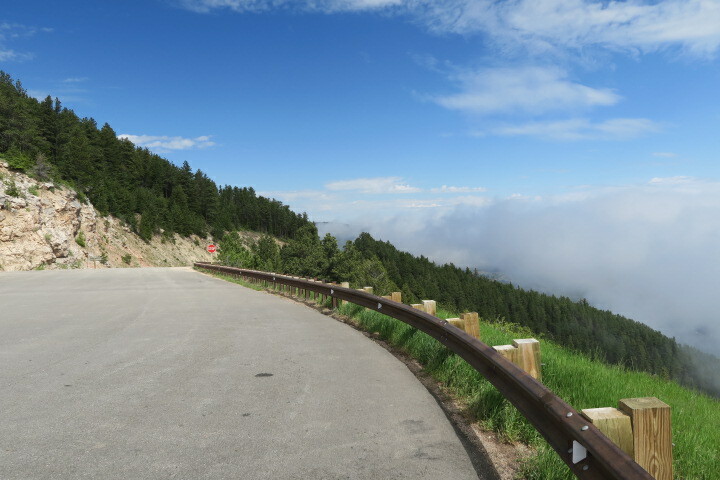 We him immediately climb via a series of switchbacks with spectacular views. 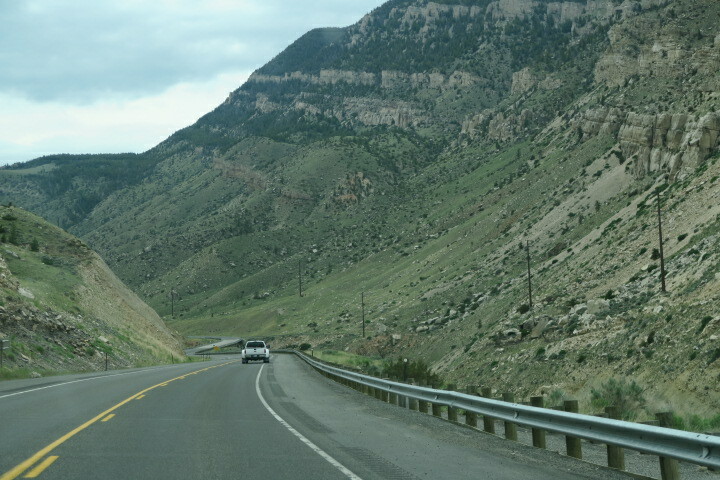 Once over the mountains we drive through flat farm country through Lovell and Powell. This still isn’t the same road we drove 23 years ago and while I’ve seen a few lupines, I’ve not yet spotted the fields of them that we remember. I’m saving that previous route for our return trip. 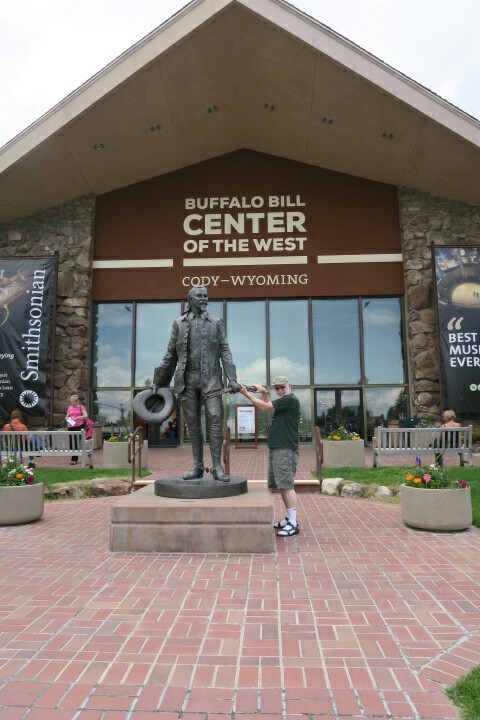 In Cody we stop at the Buffalo Bill Center for the West and happen to arrive just in time to join a tour about the history of Yellowstone. The tour guide talks about the reintroduction of the wolf and the continued placement of the grizzly bear on the endangered species list. She tries her darndest to be fair but comes off being very pro-rancher and anti–wolf/anti-bear. We ignore the politics and enjoy the rest of the tour which takes us through a portion of three of the five museums that make up the center. 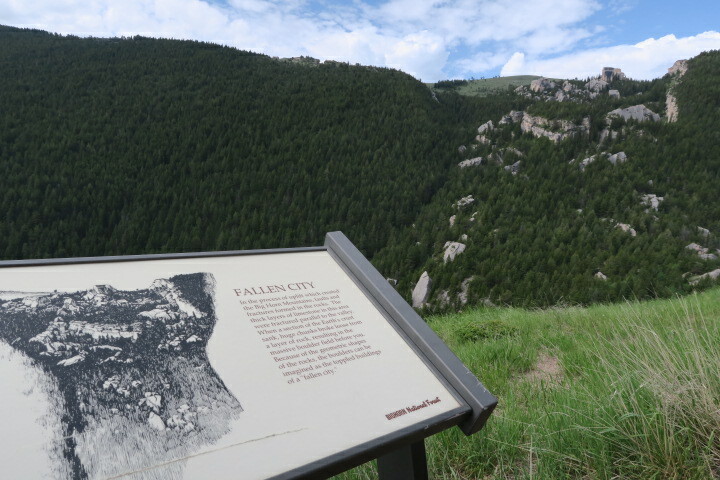 The Center is very large and joins together a Museum of the Plains Indians, a Western Art Gallery, a Buffalo Bill Museum, a Natural History Museum, a Firearms Museum plus there is a sculpture garden outdoors. 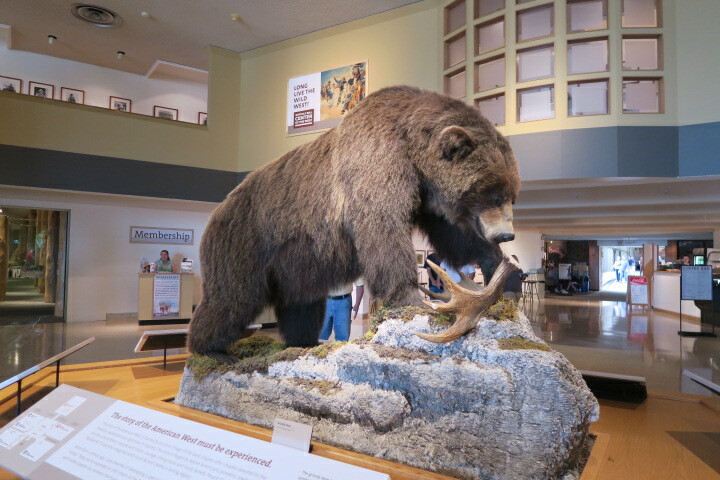 After the Yellowstone tour, we walk through the western art gallery but it’s getting late and we need to check into our cabin before 7. Reluctantly, we pull ourselves away from the exhibits and drive an hour to Pahaska Tepee. Pahaska Tepee was Buffalo Bill’s hunting lodge. 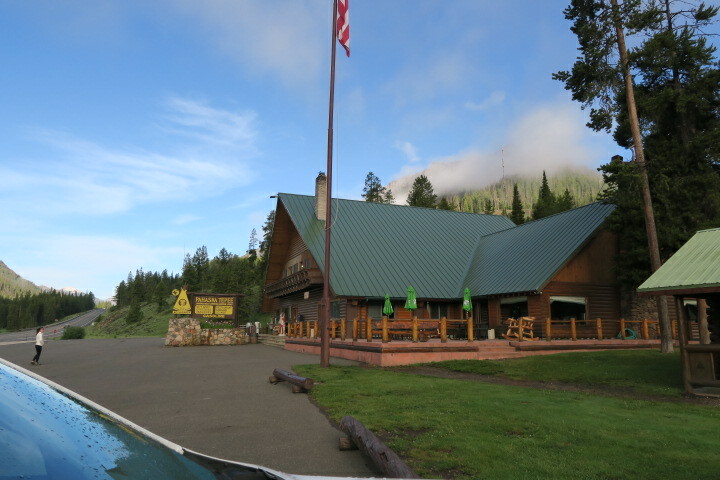 While the historic log building still exists, today there are also cabins, a store, restaurant, bar, groceries and gas. 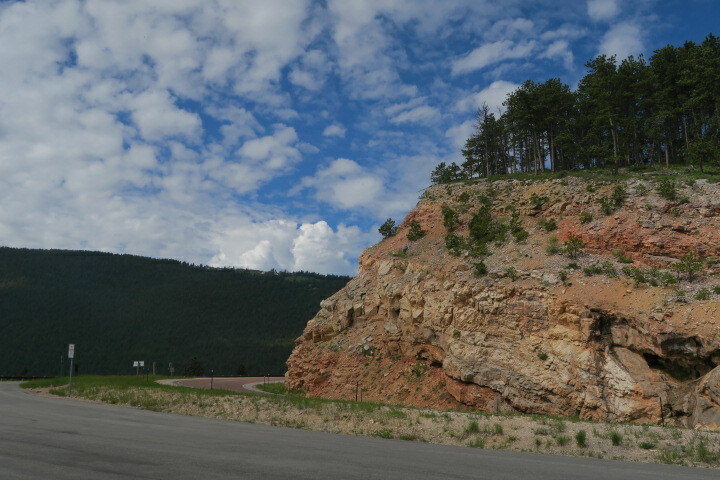 It is conveniently located outside the remote and very beautiful east entrance of Yellowstone National Park. We are surrounded by mountains, heavy with pine trees, and a fast running river. We have been warned not to approach buffalo or bears roaming around Pahaska. I’m hoping that I don’t find one on my cabin porch. 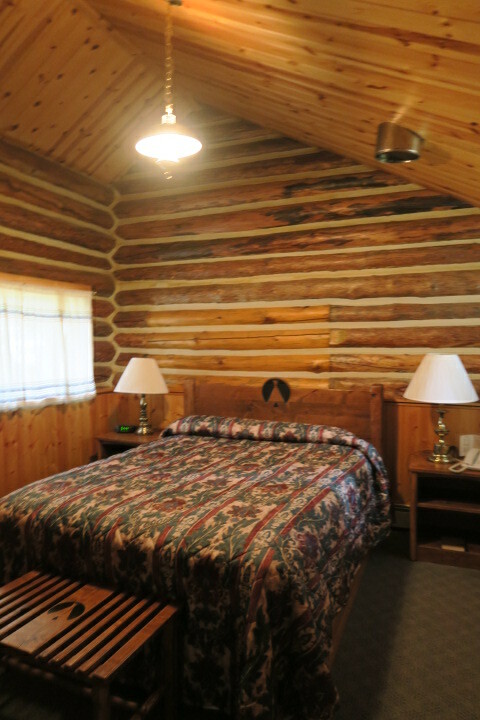 I was apprehensive about booking a cabin here because the reviews were mixed. 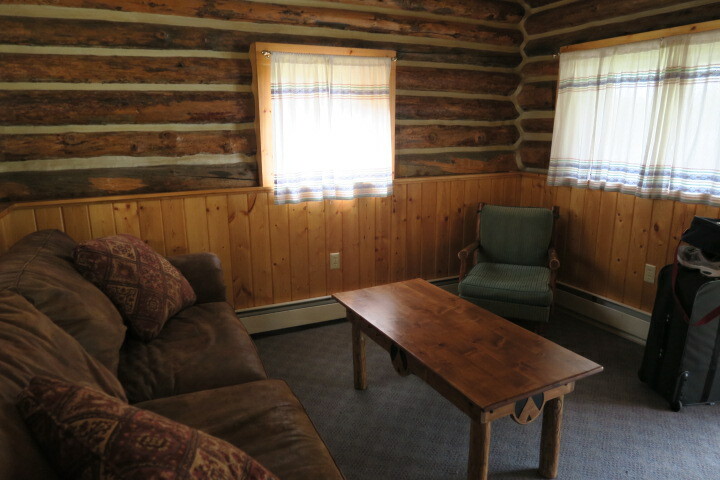 Several people complained that the cabins are too “primitive.” Doc does not do well with “primitive” lodgings. I check in and hope for the best. 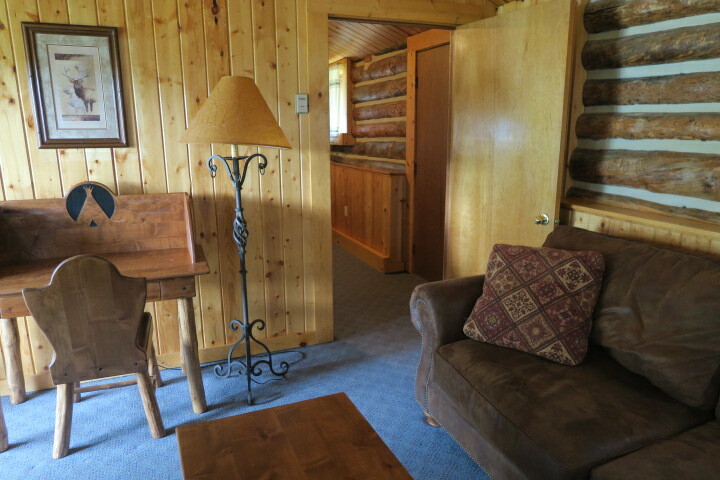 We open the door to cabin #1, a queen suite with a private bath and living room. There is no TV, no WiFi, and no cell phone service but we are expecting this. We have had almost none of these services since we left the Rapid City area anyway, so we’re used to it. There is no air conditioning either, but it’s in the 30’s at night so it doesn’t matter. The cabin is lovely. Everything is clean and modern and quite comfy. I set down my bag, breathe a sigh of relief and close the cabin door. On the back of the door is a notice stating that we should keep food stored in tight container and keep our door locked. Memories of an old Walt Disney show flashes through my head – a show about Yellowstone cubs entering cabins and wreaking havoc in the kitchen. I lock the door. We have dinner in the Pahaska restaurant. Doc orders trout. I have the daily special of steak fajitas, black beans and rice. The steak is tender and the beans are homemade. The whole meal is FANTASTIC. I can’t think of a single reason why anyone would give this place a bad review. Are people that attached to their TVs, computers, and cell phones? As the sun sinks behind the mountains, it begins to rain. Our waiter mentions that it rained every day in May. Everything is green and lush and the rivers and creeks are all running full. Doc is worried about the weather and says he hopes it doesn’t rain tomorrow. I had read the daily weather report while checking in at the front desk. It calls for a 30% chance of heavy rain tomorrow. Nevertheless, I assure Doc that it isn’t going to rain on our vacation. 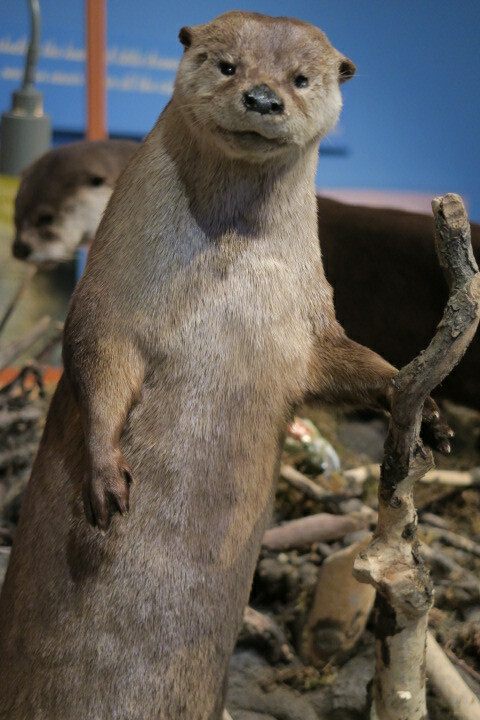 It never rains on my vacation, I tell him. Doc scowls and calls me a dreamer. I might be a dreamer, I say, but it still never rains on my vacation. It rains heavily all night but it doesn’t matter. We’re in our cozy cabin, enjoying the patter of the rain drops on our rooftop as we read and get ready for bed. I cross my fingers and assure Doc that the rain will be gone by morning.